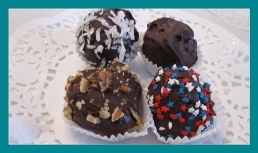 Cake Balls & Cake Pops - Welcome to Anna's Home Bakery! Cake balls and cake pops are a fun twist on the traditional cake/cupcakes. Same great flavor with a unique presentation. Covered in chocolate with the frosting already inside, they make excellent party favors and gifts! Cake Balls start at $18.00/dozen*. *Prices depend on level of customization and decoration. Please note cake balls and cake pops are for local pick-up only! Cake Flavors: chocolate, white, yellow, etc. Frosting Flavors: chocolate, vanilla, strawberry, butter cream, lemon, etc. 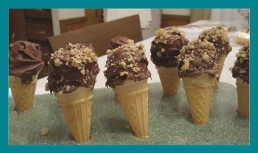 Toppings: contrasting chocolate drizzle, coconut, nuts, chocolate shavings, sprinkles, etc. but I would be happy to create a unique blend of flavors just for you! Call me at (248) 852.4559 or (248) 703.8665 (cell) or E-mail me at rauanna@att.net. Please remember cake balls and cake pops are available for local pick-up only. Minimum order (per flavor combination) is one dozen.